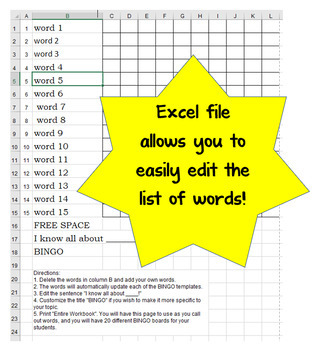 Generic Editable BINGO - Easy, quick and fun! Enter your words ONE time and create 20 unique BINGO games! Practice sight words, spelling words, vocabulary, etc. with your students through a fun BINGO game! All you have to do is type in the words you want to practice and click PRINT. 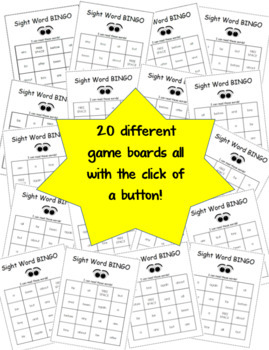 You will have 20 different game boards for your students! Super quick and easy! You will have the Input page as your call-out list. Call out the words and students can place a counter, paper cutout, counting bears, etc. on the word when they find it on their board. The first student to cover 4 words in a row wins! In my class the winner's prize is to be "teacher". They sit with me to call out the words for the next round. This is a free, no-fuss prize that the kids LOVE! Plus, it gives the student another opportunity to practice reading the words! 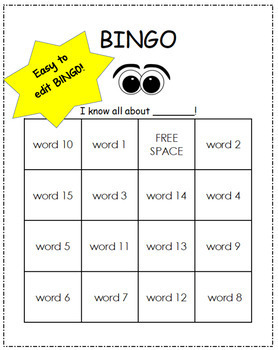 There are two versions in this file: one with the title "Sight Word BINGO" and one with a generic "BINGO" version. Both are completely editable to whatever words you want to use. *If you would like to have this BINGO game with more words, just let me know and I can make it happen!